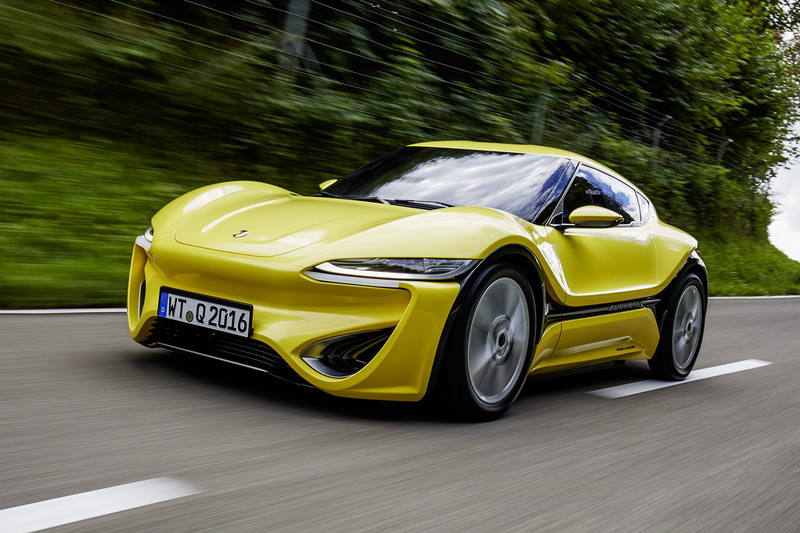 Research company Nanoflowcell, which revealed two electric car concepts powered by liquid-battery technology last year, is in talks with a “large manufacturer that is not German” about putting the Quantino concept into production. The German/Swiss company’s technology boss, Nunzio La Vecchia, said the car could be rebranded and the technology could be licensed for other vehicles. “The car and the availability of refuelling could be a reality in four or five years’ time,” he said. According to Nanoflowcell, which has administrative headquarters in London, the technology used by the Quantino and Quant FE concept cars could eclipse all others in a future minimal-carbon world. It uses positively and negatively charged liquids, stored in separate tanks as ‘fuel’, to generate electricity. These non-hazardous, easy-to-manufacture and easy-to-store electrolytes can be dispensed to vehicles as painlessly as hydrocarbon fuels currently are, so there is no need either for lengthy charging times or the infrastructure they require. The cars were originally revealed at the 2015 Geneva motor show. Just before this year’s show, the now road-registered Quantino was driven non-stop for 14 hours on one ‘charge’ — an impressive feat for an electric car. Now, in a test drive at the TCS test track near Zurich, Switzerland, Autocar has seen for itself that the liquid-battery technology works. ‘Redox’ liquid batteries like this were invented in the 1950s and improved by NASA in the 1970s, but the much greater energy density through single-use electrolytes is Nanoflowcell’s breakthrough. That density, in energy stored per litre of fuel, is still far short of diesel oil at 600 watt-hours versus 10,000, but whereas a diesel engine loses up to 80% of its energy as heat, the Nanoflowcell system is claimed to be more than 95% efficient. The Quant FE is a four-seat, supercar-shaped machine with an electric motor at each wheel, producing a total of 2140lb ft of torque. This is needed to pull its hefty weight, totalling 2300kg if the two 250-litre tanks are full of the ‘bi-ION’ electrolytes. However, the smaller, 2+2 Quantino is a much more significant car. As driven by Autocar (below) with two 159-litre tanks, good for a claimed range of more than 600 miles, it weighs 1420kg. A possible production version would have two 85-litre tanks and weigh 1045kg, filled. Its single Bosch motor, driving the rear wheels, runs on just 48V rather than the usual hundreds of volts in an electric car. With low voltage comes the need for high current, up to 300 amps, which normally needs thick, heavy cables. However, here they are thin, thanks to the use of patented step-up and step-down systems at the beginning and end of the cables. 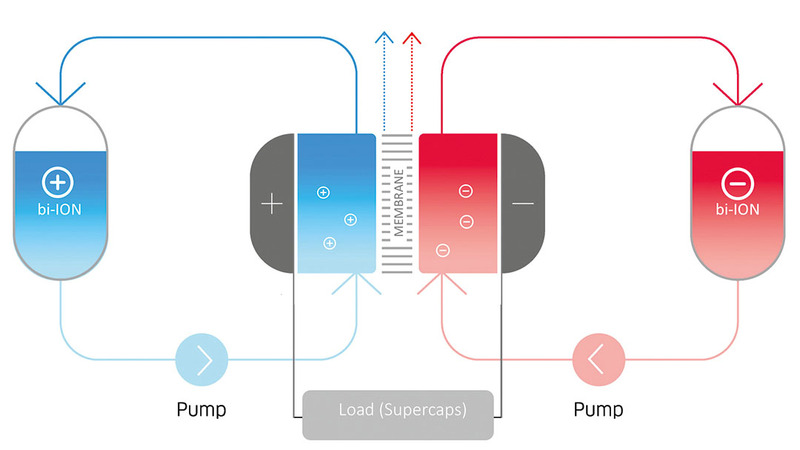 The Nanoflowcell system powers a car’s electric motor, or motors, by means of ion exchange between a positively charged liquid and a negatively charged one. The liquids — mainly water carrying an as yet undisclosed mix of organic and inorganic salts (“engineered by nanotechnology”) as an electrolyte — are kept in separate on-board tanks and circulated by pumps into the flowcell, in which a semi-permeable membrane, like a fuel cell’s, keeps the liquids separate while allowing ions within them to cross. This creates an electric charge at the membrane. The water in the spent electrolyte is either vaporised or, under conditions of lower load, temporarily stored in a tank for later vaporisation. By making the electrolyte single use with an irreversible chemical reaction, rather than rechargable, as it is in a conventional battery, it’s possible to get much more power out of the cell. Residual salt particles in the spent electrolyte are trapped in a filter, which is changed every 6000 miles. More than just concept cars, these are fully engineered, beautifully built prototypes, road-legal and licensed in Germany. They are built around carbonfibre monocoques and have been styled by Nunzio La Vecchia. The FE features pillarless flanks, gullwing doors and touch-sensitive, capacitive switches under its wood veneer. It accelerates like a Tesla Model S on heavy stimulants, a head-long rush towards a claimed 186mph top speed, its four motors whining and shrieking with dissonance as their speeds vary through corners. The Quantino is calmer but still rapid, with 106bhp, 148lb ft, 124mph all out and a claimed sub-5.0sec 0-62mph time. Much of its running gear and plenty of interior fittings come from a BMW 2 Series for ease of homologation, but this prototype currently contains large tanks that have forced the flowcell to sit where the rear seats should be. It drives as a compact electric car should: wieldier than the FE, effortlessly torquey and with regenerative braking that’s not too obtrusive as it recharges the large ultracapacitor that provides the instant accelerator response. Sounds and looks great, but a modern diesel is up to 44% efficient, a petrol is up to 30% efficient, dunno where you got the figure that diesels loose 80% of energy through heat from, but its wrong. Not sure of the true figure but whatever it is you have to remember to energy needed to get it out of ground, refine it and transport it to the POS. When it is cheaper than diesel we will buy it. And let's not forget we have no information as to how much energy, and from what source, it takes to make this water based positive and negative fuel. Let's also not forget that the distribution of electricity from remote wind farms causes loss of energy not dissimilar to the energy costs of moving oil and gas. It appears from the article that it takes two tanks of 85 litres each to obtain a range of 300 miles, interesting development but it all hinges upon the economics. The key is "up to" 44%. At exacty (say) 3243rpm, the engine will be 44% efficient. above or below this optimal engine speed it will be lower. So this works well in large ships that drive generators as the engine speed never varies. In the real world, engine revs vary, so the engine never runs at optimum efficiency so 20% sounds about right. Auid and VW 1191cc pumpe duse was 50% efficient! Almost all container shios are 50% to be competitive in gloabl market. Been running one for 15 years and 1/4 million miles. So finally the car that runs on water. I heard of this legend from my dad and conspiracy theorists that it was blocked by oil producers. Times have change hey. Fill both tanks with water and see how far you get. Anyone read about the new breakthrough at Oak Ridge National Laboratory where they made ethanol from carbon dioxide and electricity using a nanotech wafer as a catalyst? They got it upto 70% conversion efficiency. If the electricity used in the process is derived from renewable sources, this could produce carbon neutral fuels (it literally converts the CO2 in air) useable in existing combustion engines. I hope they can figure out a way to make it scale industrially. If they can, tech like this flow cell will be dead in the water. Mind you only a tiny % of "breakthroughs" like this ever make it out of the lab. A fix to re-fuelling times ? The re-fuelling/re-charging time has always been the key barrier to EVs, particularly for 'single-car families' which need a vehicle to multi-task. This technology seems to fix that bug bear and allows cost-effective re-purposing of existing infrastructure as well as re-fuelling 'through-put' at filling stations commensurate with fossil fuels. At last, the Holy Grail found ? I hope so.